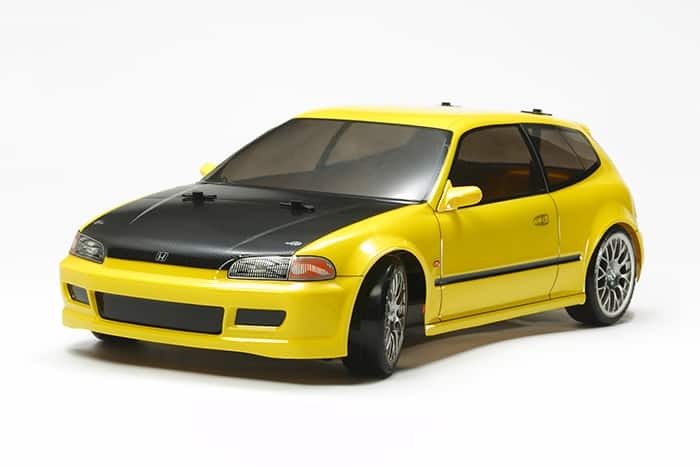 This exciting drift spec TT-02 assembly kit recreates the Honda Civic SiR (EG6). The EG was known as the “Sport Civic” in Japan, and was the fifth generation of the famous car. It had a vibrant look, said-to-be inspired by the famous Brazilian carnival atmosphere. The Civic had a 170hp inline-4 DOHC VTEC engine under the bonnet of the top-spec SiR hatchback, which made for plenty of power at the time. The car was a regular sight in Japanese and international racing competitions. Special feature 1 The TT-02D is the specially tuned drift spec of the popular shaft-driven 4WD entry chassis, the TT-02. As such, it is compatible with TT-02 option parts. Special feature 2 Features 24mm width drift-spec tires on mesh wheels, CVA oil dampers, full ball bearings, a sport-tuned motor and aluminum motor heat sink. Special feature 3 Includes 540 Sport-Tuned motor and TBLE-02S ESC with brushed and brushless motor mode.